Seymour Tower lies off the south-east coast and is in the Ramsar Wetlands site. Here you’ll be more than 1 miles from the nearest house and literally on the bottom of the sea. But there is no need to bring a mask and snorkel. This area is a unique intertidal zone and is full of amazing marine life and history. 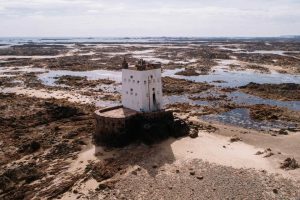 If you do not know much about the tides in this area, join a guided walk with Jersey Walk Adventures or find a person who goes low water fishing in this area. The latter should know their way around though they’ll probably try to avoid showing you their favourite lobster holes. On your left, the dark lines on the beach are the oyster farms. You’ll often see tractors and people busy working on the oyster beds at low tide. Jersey has the largest oyster farms in the UK, and you can eat fresh Jersey oysters at Seymour Inn. Ahead is a metal rescue tower. The seaweed on the structure shows you how high the tide reaches. The walk takes you across rocks, sand, mud and through the water. Each habitat has a huge range of marine life. Sandbanks appear as if they should be on a Caribbean island and the water is crystal clear. If you turn a rock over you’ll discover a world of vivid colours and mini beasts but remember to turn the rock back otherwise the creatures will die. All of this intertidal area is an internationally recognised “Ramsar” Wetlands site and has an incredible level of biodiversity. 150m south-west of Seymour is a rock with the letter “P” carved on it. It’s quite hard to find and marks the boundary of the ancient feudal land of the Payn family. 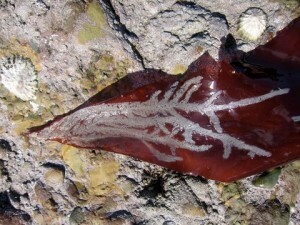 They were granted the right to gather vraic (seaweed ) following a land dispute in 1747. 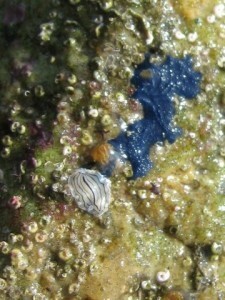 The stones in the rock-pools are covered in purple Lithothammion which may explain why the area is called the violet bank. Seymour Tower was constructed in 1782 following the Battle of Jersey and was used as an early warning station in the event of an attack by the French. There are excellent views from the lower parapet of the entire southeast coast of Jersey. In good visibility, you will see the Normandy coast. Return at low tide but do not linger. The tide rises very quickly, and the inshore channels closest to shore are the first to fill. Time: 2-3 hours depending on how often you stop to explore the marine life. Terrain: Expect to walk over uneven and at times rocky ground and to get wet, perhaps up to your knees. The walk is only possible when low tide is below 2m. Start 2 hours before the low tide because this allows time to reach Seymour Tower -and get back- without becoming a rescue statistic. Return at low tide and do not linger. The tide rises very quickly, and the inshore channels closest to shore are the first to fill. If you do not have much knowledge about the rise and fall of the tides, it is best to join a guided walk with local residents. Refreshments: Cafe at la Rocque harbour, Seymour Inn. Quite a few April walks on the seabed, Moonwalks and Bioluminescence walks are already fully booked. Advance booking is advised.